– click here to get free instant access to the SEO Content Writing Cheat Sheet to learn how to write website content with good SEO. How to write content for website – To write website content that is found by Google and ranks in the search results, you need to follow a proven strategy. This starts with first understanding your audience and knowing their pain points and what they want. To know how to write great content for your website or blog, you must start with finding a good keyword. The keyword will define what you will write about on your website page or blog post. It must have a decent volume of searches but at the same time, be low competition so you can easily rank for it. How to write website content with good seo? You don’t have to be a “writer” to write good content for your website. You just need to follow a step-by-step system that works. 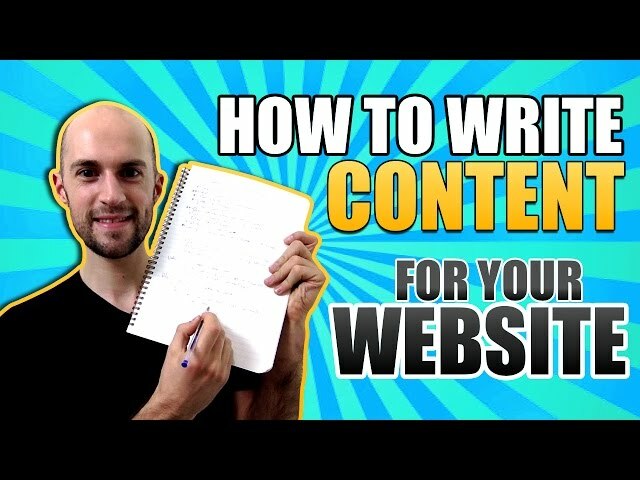 When you watch this video on “how to write content for website”, you’ll know exactly where and how to start. Want to know how you should write your website content? Therefore, how to write content for website offers, is to get the attention of your prospect with the very first line. This is why spending time to craft your headline is worth every minute you invest. Write 100 headlines, then pick the best one out of those. Great plugin, I didn’t realise it managed the rich snipit information as well. Iam starting content to write for my website please give some tips to get a great and realistic original content to have a better positions in google . Good tips man! I might try some of these out with my clients. Really solid videos!! Thanks a tun!